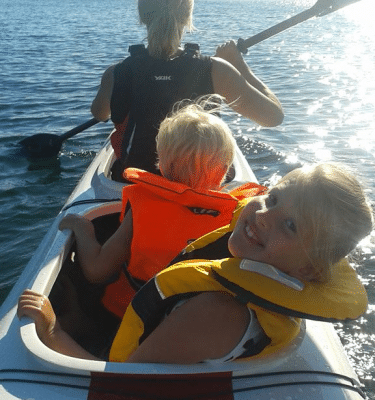 If you would like to explore kayaking with the family this is the tour for you. 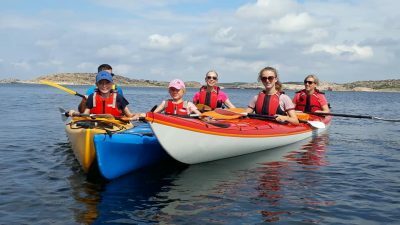 Together with qualified and experienced guides we take you and your family out on a fun and safe kayaking adventure in the close and sheltered archipelago. We have kayaks and equipment that fits all ages and level of knowledge. Usually one adult share a double kayak with their child or grandchild. But we also have junior kayaks and kayaks that fit two adults and one child if the child is to young to kayak on their own. You will get a chance to learn the basic paddling techniques and how to enter and exit a kayak in a safe way. This tour is only done in good weather conditions and if the wind would be to strong we will offer an alternative date. The key and goal for the day is to create and share a great experience that will become a nice memory. Kayaking is a great way to experience the nature and a nice experience to share with the ones you love and care for. If you have any questions or concerns please dont hesitate to let us know. You need no prior knowledge. The tour itself is an introduction to kayaking where we continually train in the basic skills you need. It is a good idea to bring sun protection, swim/neoprene shoes, water and extra clothes.